Senator Bob Peterson meets with area superintendents to discuss education policy in the McClain High School library in Greenfield. 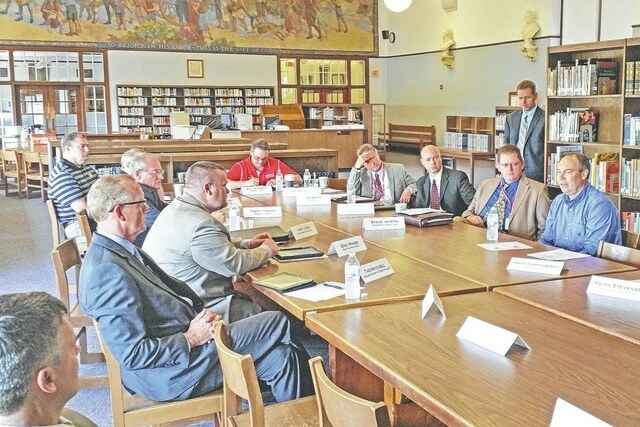 Superintendents from Adams, Clinton, Fayette, and Highland counties, the Southern Ohio Educational Service Center (SOESC) and the Ross Pike Educational Service District met with Ohio Senator Bob Peterson May 8 at McClain High School in Greenfield and with Ohio Speaker of the House Cliff Rosenberger May 28, at the SOESC to discuss K-12 education. Superintendents took advantage of the opportunity to meet with state legislatures and open the lines of communication to discuss shaping the future of K-12 education policy. Peterson and Rosenberger participated in a round of questions and answers and welcomed the exchanging of ideas offering insights and options to better education.